Chuck and I took a field trip to Millis, MA to visit Twist Bakery Cafe. While it's not cooperatively-owned, we wanted to visit because it's a locally-owned cafe and their focus is on allergen-free foods. One of the business ideas we've had for our town center is that of a co-op bakery cafe. Twist owner Kathryn Ernst took time out of her busy day to sit down and talk with us. As we chatted, I sipped my coffee, supplied by local roaster Karma Coffee in Sudbury, and tried to ignore the blueberry cream cheese hand pie on my plate. Twist, which celebrated its two-year anniversary in December, offers seasonal and local foods prepared on the premises. They do not use corn syrup, artificial coloring or hydrogenated fats. They have always been gluten and peanut-free, and will be phasing out other nuts entirely this spring. 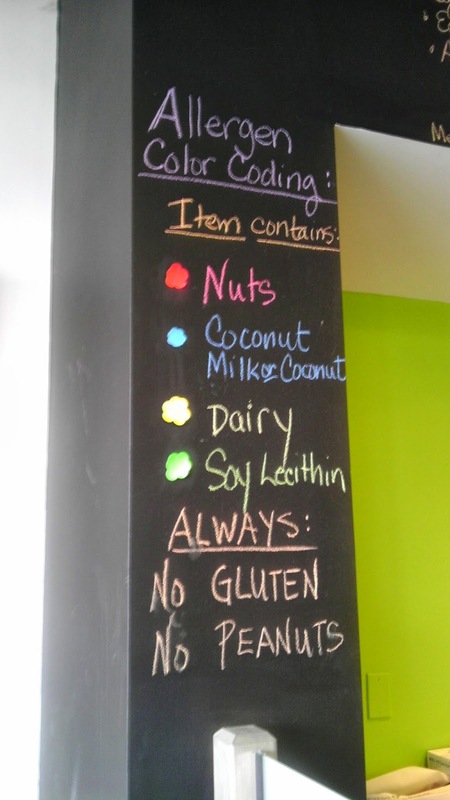 Other potential allergens are noted using their color-coding chart shown here. Twist offers catering and they are open until 5pm daily. Kathryn chose to open her business in Millis, rather than in the nearby town where she lives because there are septic limitations in her town. A bakery uses a lot of water, she emphasized. This set off alarm bells with us, as we've heard about the septic limitations in our town center. We intend to visit our health department for the full story on this situation. From the start Kathryn wanted to offer savory as well as sweet food items. "People can't live on sweets alone," she said. 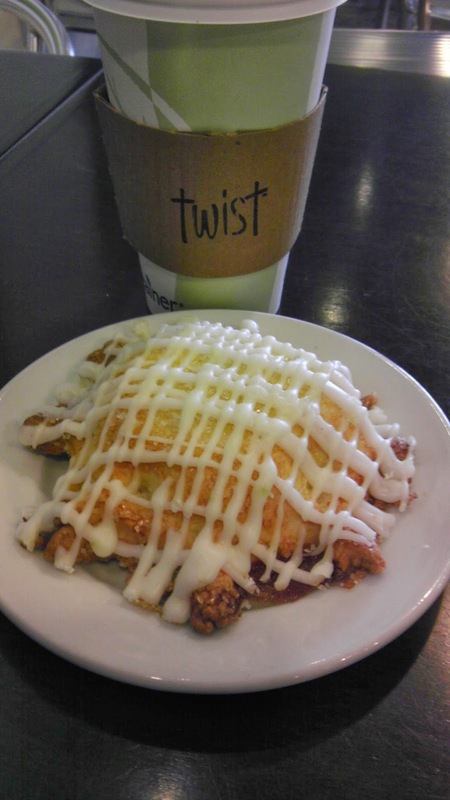 To that end, Twist bakes their own gluten-free bread and serves it with several sandwich options daily. They also have specialty meal offerings on weekends. Kathryn enjoys the creativity involved in preparing food and seeing her vision to come to life. She made it clear that opening a business is a lot of work, and that restaurants are especially challenging. 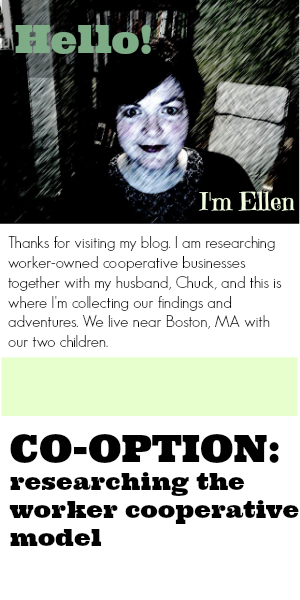 As a hands-on business owner she has worked hard to create a "third place" in the community. The people she has met along the way, and the regular customers she has gotten to know have been a real joy. Kathryn told us about her visit to Tartine Bakery in San Francisco. After hearing so much about it and their two cookbooks, it surprised her to see how small it actually is. This made an impression on her. Check out this video about Tartine, unless you're allergic to wheat and seeing freshly baked wheat bread will make you sad! After we thanked Kathryn for sharing her time and expertise with us, we dug into our pastries. The blueberry cream cheese hand pie was delightful, bursting with berries on top of a sweet bed of cream cheese resting inside of a flaky crust, all drizzled with icing. The lemon poppyseed muffin was light, nicely tangy with a delicate icing on top. 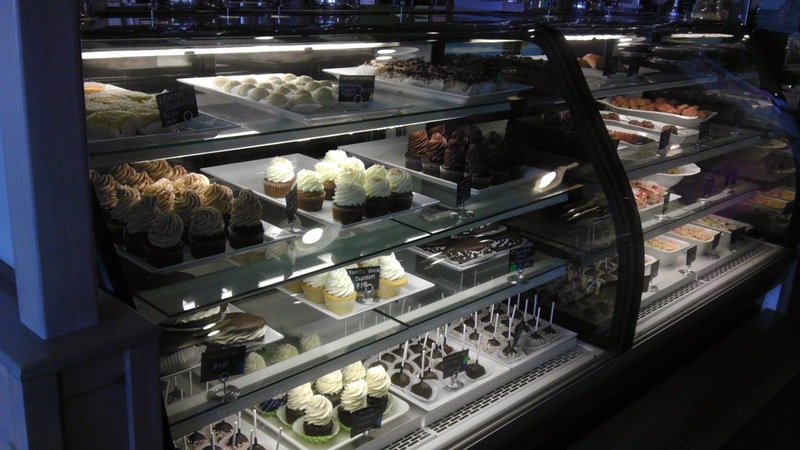 In short, Twist's pastries would please anyone, whether one needed to avoid certain allergens or not. We bought a couple more pastries to take home. Local readers should definitely make a trip to Twist! Talking to Kathryn affirmed our conviction that we do not want to own this kind of business by ourselves. What we have in mind is a community-building co-operative enterprise undertaken with a committed group of people who want to share in the responsibilities of ownership and profits. AND we want to be able to get a good cup of coffee in the town center.